Home > Stat > Drug-Resistant E. Coli: A “True Superbug”? Drug-Resistant E. Coli: A “True Superbug”? A strain of the sometimes-deadly bacteria is defying antibiotics. A “TRUE SUPERBUG” is what researchers worry a drug-resistant strain of Escherichia coli could become. 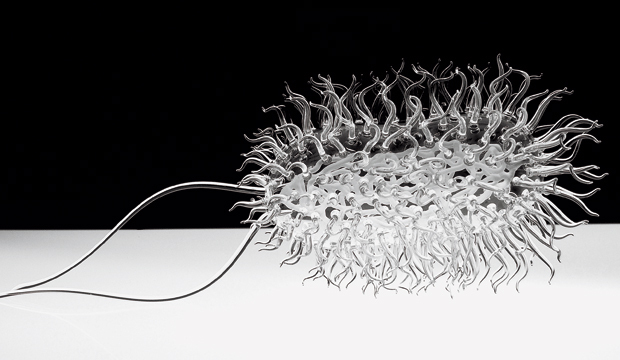 The diarrhea-causing, sometimes-fatal bacteria—here, supersized 500,000 times in a three-foot-long glass sculpture created by artist Luke Jerram with the help of virologists and glassblowers—is typically treated with antibiotics. But research recently published in the journal Clinical Infectious Diseases found that, among 1,600 U.S. patients afflicted by the bug in 2007, the ST131 strain caused as many as 69% of the infections that were resistant to the main antibiotics used to treat E. coli. Take a second look at the most compelling images from the opening pages of past issues of Proto. As resistance to antibiotics grows, might phage therapy, a treatment that fell out of favor decades ago, be the answer? Proto readers share their thoughts on antibiotic resistance and research funding. Researchers have discovered 93 strains of antibiotic-resistant bacteria in a cave in New Mexico.